Suitable for nervous riders. Open to any age. Very popular with first time riders who require a more relaxed pace. Treks can be for one hour or half an hour. Suitable for novice / intermediate and experienced riders.All riders must be able to canter safely. Please state when booking which grade of ride you require. Open to anyone who has never been in contact with a horse or pony. Half hour session. Under supervision at all times. Pony parties, picnic rides and jumping. Open to 6 year olds and under. Half an hour on a pony. Under supervision at all times. 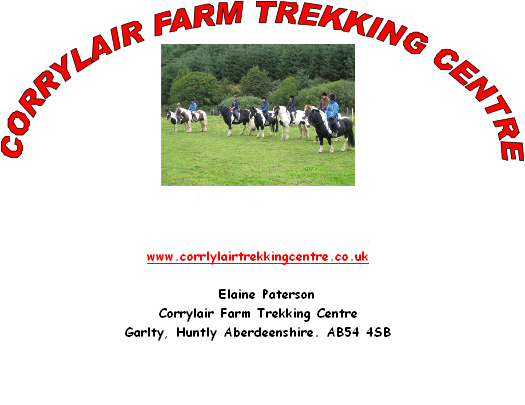 All Treks will begin with a Free 5 minute Safety briefing where you will be shown riding techniques whilst walking your horse in an enclosed area. A person who has never ridden or only ridden at walking pace. A person who is capable of walking and has performed some trotting. A person who is competent and capable up to and including a rising trot and has done some cantering and is able to apply the correct aids to stop a horse. A person who is competent and capable at canter and has performed some jumping using correct aids. A person who is competent and capable in all disciplines including jumping and is comfortable riding a forward horse.